While going through my posts for the last two memes (12MoMeme and travel meme), I noticed a lot of unfinished business. I have a huge number of drafts (87! ), many of which will never see the light of day, but which I hesitate to delete for various reasons. And I have a few ongoing or nearly complete series. Some of the series will, with any luck, be picked up next year. The Oregon Trip series is nearly complete, but needs to be posted all in one place, for my sake if for no one else's. So here goes. In late July, MOH and I took a trip to central Oregon for a family reunion. We took four days in getting there, we spent three days there, and we took two days in coming back. For the first four days, I have four rather long posts with lots of pictures. For the three days in central Oregon, I have four posts, all from a single geological field trip on one day. For the two days coming back, I so far have six posts, and haven't even gotten us back to Winnemucca. When that will happen remains to be seen; the last post was written in October. So, this is it: the 2010 Oregon Series as it stands now, with a good deal of geology, lots of photos, some flora and fauna, and a few scattered beers and brewpubs. The geology seems heavy on the volcanic rocks and volcanoes, perhaps fitting for a central Oregon trip. Oregon Trip Day 1: A Brewery, Some Geology, Wildlife, and Other Stuff: To Jarbidge, NV, via the Ruby Mountain Brewery. Includes the Great Basin to Snake River Plain transition, mesas capped by ash-flow tuff, an intrusive contact, an old hot spring or two, a basalt dike, wildlife, and more. Oregon Trip Day 2: A Hike near Jarbidge across Two Rhyolites: Jarbidge, NV. Includes the Jarbidge Rhyolite, Cougar Point Tuff, flow foliation and flow lineation, trees, wildflowers, and the canyon of the Jarbidge River. Oregon Trip Day 3: Hoodoos, a Snake, more Rhyolite, and Another Brewery: Jarbidge, NV, to Baker City, OR. Includes the Red Dog Saloon, hoodoos in the Cougar Point Tuff, the Jarbidge Forks, jointing in the Dorsey Creek Rhyolite, a snake, a marmot, Salmon Falls Dam, waterfalls into the Snake River at Thousand Springs, and Barley Brown's Brew Pub. Oregon Trip Day 4: Coffee, Fossils, Formations, Basalt, and Brew: Baker City, OR, to Redmond, OR. Includes a bit of Baker City, part of the Blue Mountains, larch and other trees, John Day Fossil Beds at Sheep Rock, the Columbia River Basalt Group with columnar jointing, the Rattlesnake Tuff and other ignimbrites, and the Red Dog Depot. Travel Tuesday: Central Oregon: A few pictures from Smith Rock State Park near Terrebonne, OR, and the Terrebonne Depot with Terminal Gravity IPA. Oregon Trip Day 7: The Tuff of Smith Rock: The tuff of Smith Rock at Smith Rock State Park near Terrebonne, OR, with photos of distant Cascade volcanoes and columnar-jointed basalt. Oregon Trip Day 7: The Petersen Rock Garden: The Petersen Rock Garden near Redmond, OR, with rocks, lots of rocks, ponds, and peacocks. Oregon Trip Day 7: A Volcano Observatory: The Dee Wright Observatory on McKenzie Pass, with lots of volcanoes and volcanic rocks, birds, threatening clouds, and a bit of Sisters, Oregon. Travel Tuesday: Cliff near Summer Lake, Oregon: A neat volcanic cliff, with basalt and interlayered volcanic ash or tuff, and a mosquito festival in Paisley. Ancient Shorelines and a Basalt Dike southeast of Paisley, Oregon: Shorelines of ancient Lake Chewaucan and a basalt dike. Turning Off onto the Winnemucca-to-the-Sea Highway: North of Lakeview, OR. The turnoff from Highway 95 to Highway 140, with a song that mentions Winnemucca. Friday Field Photos: Mystery Cracks: West of Adel, OR. Some columnar-jointed basalt with possible spheroidal weathering. Deep Creek Falls: Continuation of our Oregon Roadtrip: West of Adel, OR. A nice waterfalls over columnar-jointed basalt. 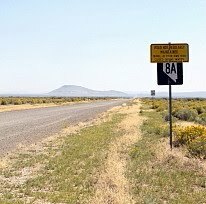 Highway 8A: The Cutoff from Cedarville to the Winnemucca-to-the-Sea Highway: Oregon-Nevada state line on Highway 140 to the junction with Highway 8A. Signs, roads, more signs, and 8A stories. Onward to Denio Junction! : Highway 140 from its junction with S.R. 8A to Denio Junction. Volcanic flow (rhyolite?) and roadside sediments, signs, and the oasis of Denio Junction. Very much enjoying reading (and learning) about the roadside geology of NV and OR. Still on Getting There but I definitely plan on reading it all. Look forward to the beers and bars!